Tim was interviewed for the magazine Kairos during an annual luxury watchmaker congress in Lausanne and mused about the endearing imperfection of human work and why true craft cannot be automated. 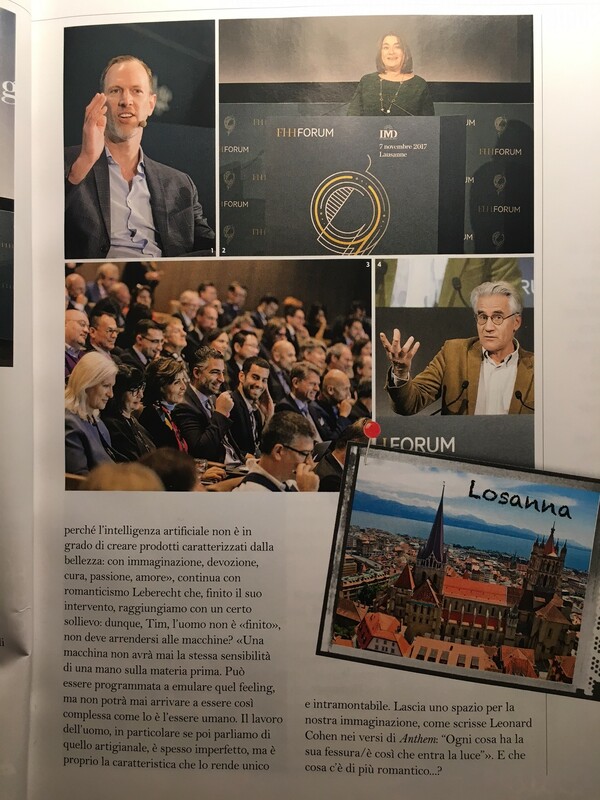 The trade magazine Kairos interviewed Tim after his talk at the Forum de la Haute Horlogerie, the annual gathering of luxury watchmakers in Lausanne, about beauty and romance in an age of algorithms and AI. Kairos: You talked about beauty and emotions: two nouns strictly linked to human. How can machines ensure the same features for example in a product? In the future will we have to give up beauty and emotions? Or is the solution the human company? TL: It’s a really blurry line already. Artificial Intelligence (AI) can already create beautiful things. For example, it can write and record songs that eerily sound like The Beatles or compose and perform entire symphonies based on musical patterns it has studied. Moreover, AI can paint in the style of the great masters. Take, for example, the “Next Rembrandt” campaign conducted by the ad agency JWT last year that featured an AI creating a painting as if Rembrandt himself had stroked the brush. In architecture and design, too, it is becoming harder, if not impossible, to distinguish man-made from machine-made creations, whether it is the kind of computational design used for buildings like Amazon’s new HQ or the Shanghai Tower, or Airbnb developing an AI-based product design service that converts design sketches into prototypes without any human oversight. Amazon has even developed an AI-based fashion designer. Plus, AI can write stories (there is even an app called “Ghostwriter” that writes the story of your life based on the data you produce). So, without doubt, AI can create things that we perceive as beautiful. What it cannot do, however – and this is an important distinction – is to do things beautifully: with imagination, devotion, care, passion, and love. Doing our work beautifully will remain a human privilege. A human company is thus a beautiful company, which means, it has the vision, leadership, and culture to encourage and reward the kind of work that must be done beautifully rather than just efficiently. K: Particularly in the luxury market, where we can find crafts with high human content, from leather goods to haut horlogerie, and where the hand of man is very important and can do the difference, how can robots replace men? How can robots create the same emotions? How can machines have the same sensibility on raw material? And then creativity: this is the most human element that we can find in an artefact, do you think that machines can replace it? How? TL: A machine will never have the same sensibility with raw material. It may be programmed to learn emulating those feelings, but they will never be as complex and ambiguous as human ones. A former colleague of mine – a technologist – recently built a Zen-gardening robot. It perfectly mimicked the human gardener and did its work as stoically as effectively. But something was missing: the interior life, the spirit, the WHY and the HOW. Machines may be able to replicate the WHAT, but art and craftsmanship is all about the WHY and HOW. Human work is always imperfect work, which makes it so endearing and unique. It leaves space for our imagination, the “cracks through which the light gets in,” as Leonard Cohen put it. Fado, the Portuguese song good, for example, cannot be automated by machines because it is full of little mistakes, small vulnerabilities. The beat is unsteady, and the musicians remain unpredictable in their contributions. The same applies to jazz and any other collective art form that celebrates human ingenuity. No one will ever sound like Miles Davis. No one will play football like Lionel Messi. Human error and inefficiency are inherently human qualities and the very source of our creativity. The value of a piece of art and any luxury item derives from the way it was produced, from the time frozen into the final artifact, the story of its creation, and the values and aspirations it represents. Machines may be able to replicate the functional value but never the symbolic one. And luxury is all about symbolic value. This is why the luxury market will remain future-proof in my opinion. If anything, it will expand, and we might see a growing bifurcation of our economies into routine-based, automated commodities on the one hand and the very whimsical and aura-based luxury items on the other. Being a human brand or company, in fact, being a human, might become the greatest luxury of all. K: By all these elements, do you think that the hand craft market will be the last to be invaded by robot? Or it will remain a human market? It’s conceivable that robots will augment or automate parts of the production process (as it already the case, I understand, for example, at Rolex), but based on current human sentiments, values, and aspirations it will certainly devalue the product unless the overall story of the product is still so strong to trump it. Those perceptions, however, can of course change. Robots may soon produce and trade products for robots, and who knows, at some point, we’ll see various classes of robots, and those on the higher end may create items that are incredibly desirable. It all depends on how we define scarcity in the future. But I don’t foresee our desire for deep human connection, as well as transcendent stories of hope and meaning – I would call all these desires ‘romantic’ – disappear any time soon, and the products and services representing and enabling them will be evermore invaluable.